Make our logo and build business card. We are attorney at law in Turkey. 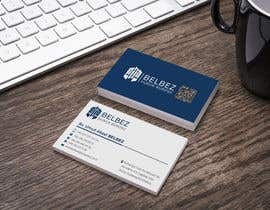 First of all, we would like to make the logo of our law firm called "Belbez Hukuk Bürosu". This logo will also be placed in letterhead.. It all depends on your choice and creativity. You can either design our logo with the initials or letters of our law firm's name (sample 1) or you can have design where the logo and the name is seperate (sample 2). Secondly, we would like to build our business card which will be simple and elegant. Business card includes our logo, title and name: Av. Umut Aksel BELBEZ, adress: Bahariye Cad. Kırtasiyeci Sk. No:48/14 K:3 Çağdaş Han 34144 Kadıköy/İSTANBUL, mobil phone: +90 537 970 44 44, telephone: +90 216 418 00 15, +90 216 418 00 25, fax: +90 216 411 11 00, e-mail: akselbelbez@[login to view URL] and QR code. I've uploaded the front and back of my current business card (sample 3).